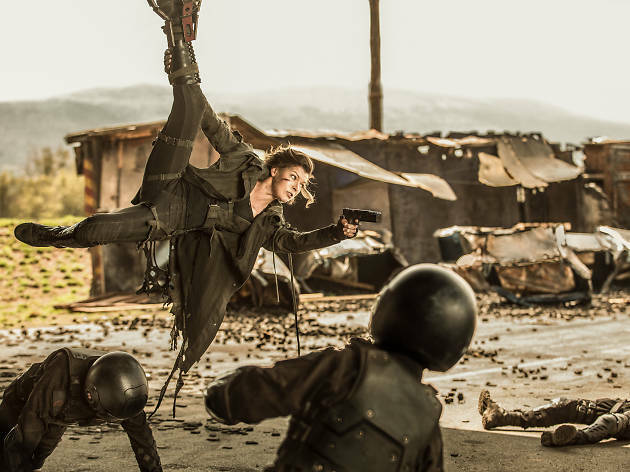 Milla Jovovich dominates the zombie action in her signature role—a steely heroine who deserves a better send-off. It’s a shame the Resident Evil movies are (purportedly) going away: While the franchise has slackened into dependably dumb post-apocalyptic thrills, star Milla Jovovich has only gotten better, seasoning her long-legged athleticism with a commanding stare. In another universe, she’s the sister of Charlize Theron’s Imperator Furiosa. Given some fresh screenwriters and a few chewy lines, Jovovich could have taken the series to a whole new level. Alas, she has director Paul W.S. Anderson, the saga’s longtime visionary (and Jovovich’s husband), a workmanlike filmmaker who still has a felicitous way with jaw-snapping zombies but doesn’t think to shine a light on his angel in the dust. Resident Evil: The Final Chapter plays like a greatest hits of the last five installments, restaging some of the best moments from sequels’ past. We’re back at the underground Hive, a virus factory with laser-guarded hallways. There’s also a spooky-looking cityscape or two, and an opportunity for Jovovich to take out a gang of marauders while hanging upside down from a leg trap—a piece of swirling ballet. Plotwise, you could write the thing yourself on the way to the theater. A hardy band of survivors is humanity’s last hope, while some evil corporate types scheme to cleanse the world of its riff-raff and emerge from their cryogenic sleep as gods. Certain elements of the original Lewis Carroll–inspired movie and videogame—such as the villainous artificial intelligence the Red Queen—have become stale. But there’s no denying the movie’s climactic gathering of females bent on saving the species: Jovovich’s Alice, comrade-in-arms Claire (co-star Ali Larter), the now-helpful Red Queen (here played by Jovovich’s nine-year-old daughter, Ever) and an ancient, defrosted board chairwoman (Jovovich again, effectively aged). Women didn’t get us into this mess, but they’re sure going to get us out of it. That's a fantasy worth having. Currently watching now. What the what?!? Why did the T-virus origin story change? Was no one paying attention to the 1st couple movies when they did this one? And Isaacs getting religion with all the crosses? ...and it was his clone in the previous movie?!? WHATEVER!! I am so confused right now. And Alice is a clone. Oh, jeez! Don't get me started on the action sequences! Hard to follow with all the jumping around. Was a fan, but this movie...BIG DISAPPOINTMENT. Was hoping for the war at the end of Retribution. Only good thing were the vehicles that Isaacs had. Would have stopped watching, but just have it on to watch while waiting for clothes to dry.